Mit Beiträgen von Andrea Bacová, Christoph Gollner, Hannes Huemer, Vera Mayer und Henrieta Moravčiková et al. Die Gestalt vieler europäischer Städte hat sich in der 2. Hälfte des 20. Jahrhunderts durch die Industrialisierung und Standardisierung der Wohnungsproduktion wesentlich verändert. Der Plattenbau bot sich als eine sehr rationelle Bauweise zur Beseitigung der Wohnungsnot und Erhöhung der Wohn- und Lebensqualität für die Masse an. Seit ihrer Errichtung wurden Plattenbausiedlungen zunehmend Gegenstand von Kritik. Die technologischen Konzepte verdrängten langsam die städtebaulichen, architektonischen und kulturellen. Bautechnische Mängel und soziale Probleme gelten seitdem als Attribute von Plattenbausiedlungen und tragen zu deren schlechtem Image bei. Die zentrale Frage lautet daher: Inwieweit erfüllen die Plattenbausiedlungen der 1960er bis 1980er Jahre die Anforderungen an zeitgemäßes Wohnen? Die Beiträge sollen zu einem neuen Diskurs zwischen Wissenschaft, Architektur, Wirtschaft, Politik und Öffentlichkeit beitragen und behandeln folgende Themenschwerpunkte: Teil A thematisiert die Entwicklung des Plattenbaus von der Vision zur Realisierung sowohl im internationalen wie auch konkret im Wiener Kontext. In Teil B werden Siedlungstypologie, Haus- und Wohnungsformen für die Plattenbausiedlungen in Wien und in Bratislava untersucht. Beiträge im Teil C beschäftigen sich mit der Wohnkultur zur Zeit des Plattensiedlungsbaus in Wien und Bratislava. Im Teil D werden die positiven und negativen Aspekte des Plattenbaus erörtert, Fachkritik am Plattenbau und Bewohnermeinungen analysiert sowie die projektbezogenen Forschungsansätze vorgestellt. Im Teil E werden schließlich die Ergebnisse des im Rahmen des Projekts durchgeführten Studentenwettbewerbs „Plattenbausiedlungen – moderne Wohnstätten von morgen“ präsentiert. In the second half of the 20th century, industrialised and standardised housing production changed the outward appearance of many European cities dramatically. Prefabricated large-panel structures seemed a highly economical and efficient construction technique to eliminate housing shortages and improve both the quality of housing and the quality of life for the population at large. Since their emergence, however, prefabricated large-panel developments have been subject to growing criticism. Technical concerns have gradually begun to override those of urbanisation, architecture and culture. Structural defects as well as social problems are now considered to be concomitant aspects of prefabricated large-panel developments and have contributed to their negative image. Hence the central question must be: to what extent do the prefabricated large-panel developments of the 1960s to 1980s still meet the requirements of contemporary housing? This volume should contribute to a new discourse between scientific research, economics, architecture, politics and the public at large. The papers focus on five themes: Section A broaches the issue of the development of prefabricated large-panel housing from the initial concept to its realisation, both in the international and the specifically Viennese context. Section B presents the most important typological characteristics as well as the types of buildings and apartments in Viennese and Bratislava large-panel housing projects. 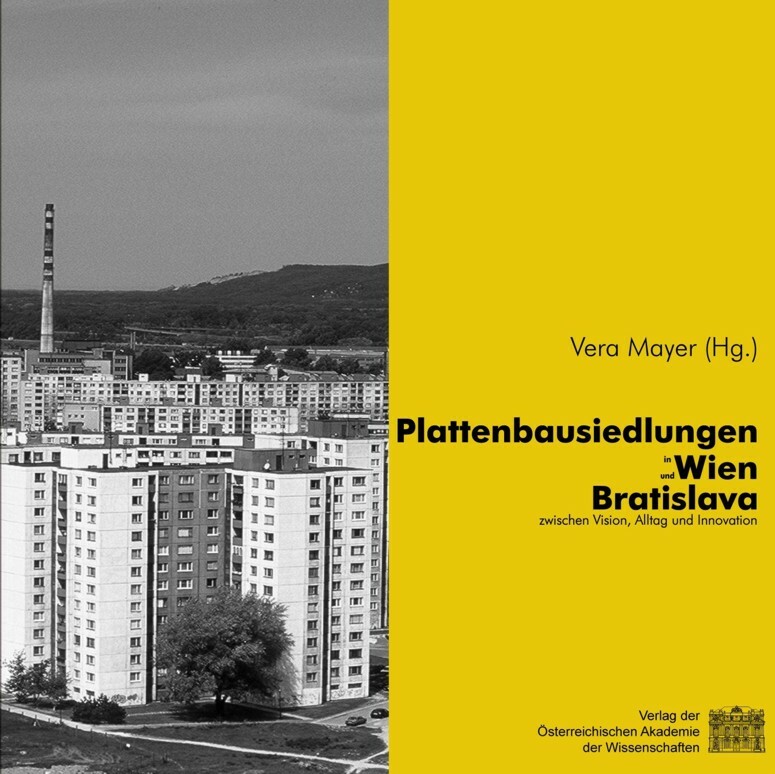 The contributions in section C deal with housing culture and lifestyles during the era of prefabricated large-panel housing construction in Vienna and Bratislava. Section D discusses the positive and negative aspects of prefabricated large-panel housing, analyzes experts' critiques and tenants' opinions, and describes the research project’s methodology. Section E presents the results of the student competition "Prefabricated Housing Estates – Modern Dwellings for Tomorrow", which was part of the research project.